Don Rosa is perhaps the only person associated with Disney’s Scrooge McDuck nearly as much as creator Carl Barks. 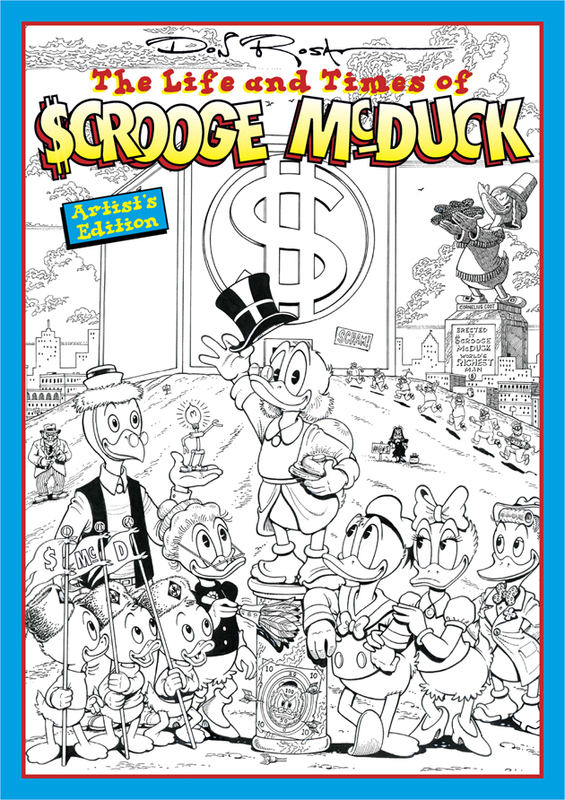 Now IDW Comics bring us Don Rosa’s The Life and Times of Scrooge McDuck Volume 1 as their next Artists’s Edition release. What’s an Artist’s Edition? The pages are 14″ by 20″, the size of an actual comic artist’s drawing board — in other words, huge! Though the images are in black and white, they are copied from the original art in color — allowing the viewer to see things like paste-overs, blue sketch lines, editorial comments and more, straight from the artist’s original sheets. 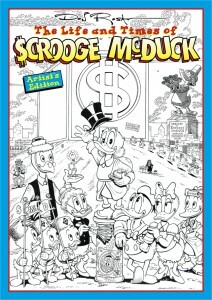 From the IDW web site: “Rosa’s Eisner-award winning work on The Life and Times of Scrooge McDuck told the story of the penny-pinching mallard’s early days before he made his legendary fortune.” At over 160 pages, this hardcover edition (the first of three upcoming volumes) is headed to stores this April. If you haven’t caught it yet, word is spreading fast that Disney TV Animation plans to bring back 90’s cartoon favorite Duck Tales in a whole new series on Disney XD, starting in 2017. We first heard about it over at Oh My Disney: “When Marc Buhaj—Senior Vice President, Programming and General Manager, Disney XD—made the announcement, he said, ‘DuckTales has a special place in Disney’s TV animation history, it drew its inspiration from Disney Legend Carl Barks’ comic books and through its storytelling and artistic showmanship, set an enduring standard for animated entertainment that connects with both kids and adults. Our new series will bring that same energy and adventurous spirit to a new generation.’ The new series will star the same beloved characters as the old: Scrooge McDuck, Huey, Dewey, Louie, Launchpad McQuack, Donald Duck, Duckworth, Gyro Gearloose, Flintheart Glomgold, Magica DeSpell, Poe, Ma Beagle, the Beagle Boys, Mrs. Beakley, and Webbigail Vanderquack.” Nothing more precise from Disney regarding a premier date yet, but Disney XD is starting to sound more and more interesting for animation. Chappell Ellison reports on the Cartoon Brew website that the 1989 Capcom DuckTales video game is being remastered for a Summer 2013 release. The game will feature enhanced background graphics, and as much of the original voice cast as possible, including 90-year-old Alan Young as Scrooge McDuck. DuckTales Remastered is being marketed for nostalgic new parents as much as for a new generation of players. Young parents who grew up playing DuckTales on NES will leap at the chance to reintroduce the game to their kids on the contemporary consoles of today. The Cartoon Brew report includes a 2’03” trailer for the coming improved rerelease. Now that the Warner Brothers comics aren't being done by huge committees, the practice has moved to the Arch* companies. For better or worse, I can't say. Also there's a huge selection of non-pamphlet items this month, including three huge pricey bargains from Fantagraphics that I'd go for if I didn't have everything already. If you rely mainly on a standard pull list at your comic shop, you need to read this month's selections.